I've been doing quite a bit of experimentation with sunglasses recently, from different styles to materials, and it's been especially easy thanks to e-tailers like Polette Eyewear. Last Fall, you may remember I tried out some of their round frames and this summer I've been wearing the Duffin Sunglasses. Admittedly, these are more unconventional than I'm used to, given their cat-like shape, but that's all part of the fun. Plus, they are lightweight and the gold complements summer tanned skin perfectly. P.S. The lovely people at Polette are offering one of my readers a pair of sunglasses of their choice. Scroll down for all the details on how to enter the giveaway! ... Want to win a pair of Polette sunglasses for yourself? All you have to do is follow Polette on Instagram and Twitter, and like them on Facebook. Then leave a comment here with a link to the sunglasses you'd pick from the Polette website if you win. Winner will be drawn randomly. Giveaway ends July 23. Your look is so chic girlie!! You look stunning! I love your hair against all black. That bag is to die for! Love the look! Such a different take on Vancouver Chic. Adorable sunnies!! i want them! Those sunglasses are so unique, they really suit you! Loving the lip colour! Such a cool giveaway! Gorgeous simple chic looks. Love the glasses. You look great. I love this outfit, it's basically what I wear everyday. 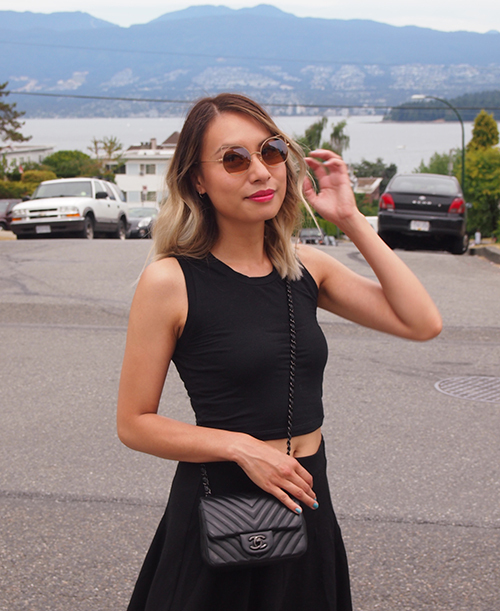 Black crop top and black skirt. Your hair looks great! Never heard of this sunnies company before, thanks for the review. My favorite sunglasses on their site is the "RUBIS.B.S"
I love the outfit! Still haven't been able to sport a midriff-baring top just yet even if just a little. Maybe I just haven't found the right top? 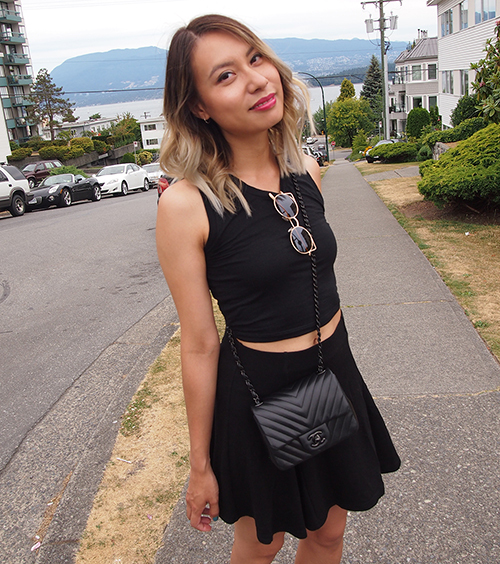 It took me awhile too but you should try this Aritzia one! With a high-waisted bottom it's not too short at all.